Jared T. Heck concentrates his practice in litigation matters, including health care fraud, False Claims Act litigation and other complex commercial disputes. He has considerable experience with all aspects of litigation, including pre-suit investigations, motion practice, discovery and trial preparation. 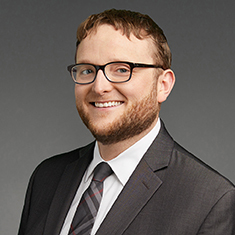 While in law school, Jared served as admissions editor of the Cornell Law Review and as a teaching assistant in the legal writing program. He also spent one semester as an extern for the City of Chicago’s Department of Law, where he prosecuted violations in traffic court, and received CALI Excellence Awards in both Employment Law and Conflict of Laws. Shown below is a selection of Jared’s engagements.